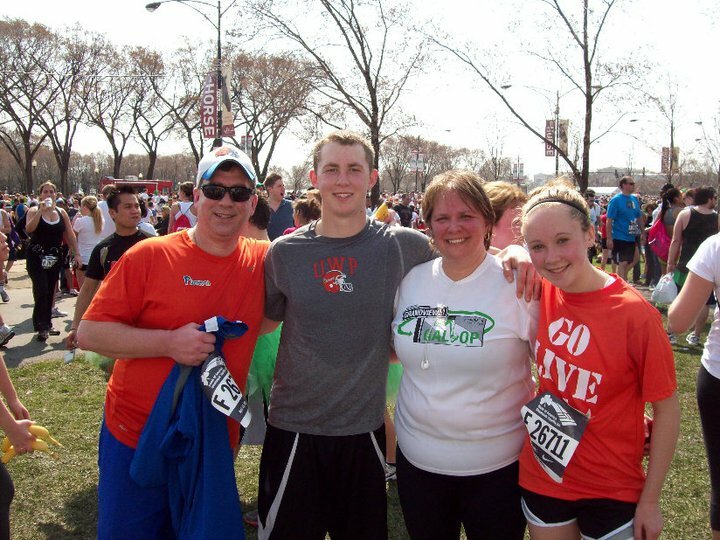 I have been counting down the day for the 2012 Shamrock Shuffle since we finished the race last year. This is by far my favorite race of the year and this year will be bigger and better than the previous races because instead of going with 3 or 4 of my closest friends, we have a huge group of over 30 ladies who will be wearing green Team Sparkle Skirts. Here is a preview of a few of us from the Oak Forest Fleadh 5K a couple weeks ago. Plus we have a few men making the trip this year too. They received a green sparkle skirt exemption and opted for kilts instead. Fun! Can’t wait for the photos! Thanks for running for me Cindy; I know the conditions weren’t “ideal” but I appreciate your helping me out! 2010 was rough for me as I was physically bouncing back from Mr. Michael. Even though he was born in September 2009, he had a lot going on and I never really got back to running until January 2010. So the Shuffle came fast. And it was hard. And it was cold. But it was still awesome because I was with my friend Lisa and a few of her friends that year. 2011 brought my return to fitness. I ran the 2010 Chicago Marathon and about died in the heat really came into my fitness AFTER the marathon. If you run a marathon, this may happen to you too. Your struggle thru the training, you struggle thru the race and then AFTER the race you are on fire. Strong. Fit. Fast. Makes for great fall racing if you are a fall marathoner. FUN! However, I was so on fire and upping my mileage like crazy that I managed to hurt myself at the beginning of March 2011. I went into the Shuffle with a smile but hadn’t run a step in weeks. C’est la vie! FAVORITE.RACE.OF.THE.YEAR. And in case you can’t tell from the photo, it was hot as hell. But I had more “friends” this year. My friend Lisa, brought the entire clan: Hubby – Mike, Son – Logan, Lisa & Daughter – Rachel. To me, this race is about more than running, it’s about spending one weekend a year fully devoted to friendship and a healthy lifestyle. A huge thank you to my friend Lisa, who comes each year from Wisconsin to celebrate this weekend with me. Really awesome! So CHEERS to the Shamrock Shuffle 2012! I will ENJOY the atmosphere and the celebration no matter the weather or the results! Do you have any annual races or celebrations that have become tradition to you? This entry was posted in "Run"Way Fashion, Running and tagged 2012 Shamrock Shuffle, Chicago, Running, Shamrock Shuffle by tootallfritz. Bookmark the permalink. The Shuffle is my race tradition! I go into it each year, with fond memories of our first 10k together, and the remembered fear that you were going to push me into Lake Michigan cuz I didn’t want to run off and leave you. NOW, you not only run off and leave ME, but you get to have a beer while you wait for me. Your single minded pursuit of fitness has motivated me to continue to keep plugging away and I love coming to Chicago and spending time with you and yours. So CHEERS to keeping the tradition alive as long as I am able to stay upright and moving forward. Cheers to keeping the tradition alive! Let’s kick some axx in green sparkle skirts! Can you meet up with us at the Hilton so we can walk over together? I am not going to carry my phone during the race….hard enough to just carry me! I will grab it as soon as I finish running. I suggested the F’N Runners meet back up at the Blue Gear Tent after the race. I will be there at the very front entrance of the tent, basically able to touch the tent, so head that way after you get done and get your gear check bag. It is close to the post race party so hopefully we can go over there after everyone comes back thru. Our big summer tradition is one of the mud runs. We dress in costume, and each year our team grows. haha. I always love seeing runners in costume during races. Never fails to put a smile on my face! Ha….Boston Marathon has become my tradition, but locally the Tinley Stars & Stripes 5k seems to be my most consistent, as well as RFK’s Turkey Trot. 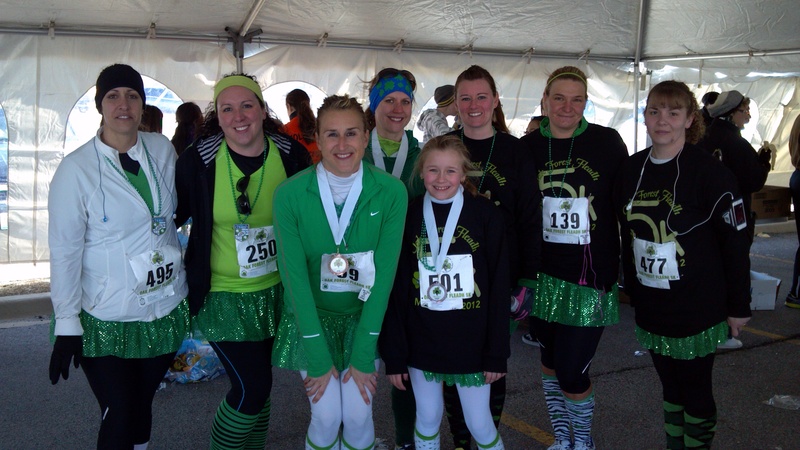 I look forward to running my first Shamrock Shuffle this Sunday….sunny with a high of 60F! Woo-hoo! You will love it. BEST.RACE.EVER. I hope to see you at some point this weekend!